It’s always fascinating to read reviews of Oheka Castle online. Brides, grooms, families, and other guests don’t just like this New York wedding venue. They LOVE it. They talk about the soaring ceilings, beautiful ballroom, meticulous lawns, and amazing bridal suite...but what they don’t talk about is the light. Oheka Castle is one of my favorite locations for wedding photography and wedding day portraits of brides, grooms, and bridal parties because the light is so spectacular. 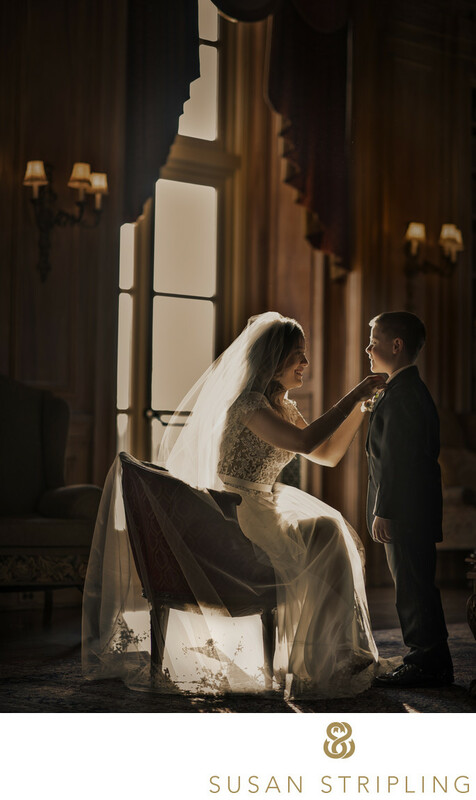 As a wedding photographer whose style is dependent and crafted around dramatic light, Oheka is the perfect place for me to shoot! I love the interplay of shadow and light in wedding photography. I love the brilliance of bright light, and the depth of the darkest shadows. I believe that shadow and light play together beautifully with wedding photography, and it's always a pleasure to work at a venue where the light is practically tailor-made for my style of shooting! There are larger locations for great light, suitable for portraits of brides, grooms, bridal parties, bridesmaids, groomsmen, parents of the bride, parents of the groom and wedding day family pictures. One of those locations is the Terrace Lawn and the Back Gardens. Meticulously maintained and landscaped, these beautiful outdoor locations are the perfect place for your bridal portraits, pictures of the couple together, family formal portraits, and ceremony images. I love watching the sun cross the sky in these locations, watching it set perfectly over the golf course in the distance. I’ve seen some of the most spectacular sunsets at Oheka Castle! There are many indoor locations with spectacular light as well. The Grand Ballroom has huge windows that let in beautiful sunlight at all times during the day. The formal Dining Room and Terrace Room also have dazzling light, perfect for portraits of the couple. One of my favorite rooms is the Library. When the sun starts to set, the entire library turns gold. The light pours in through the doors and windows, skating across the wooden floors and burnishing the walls with a golden glow. 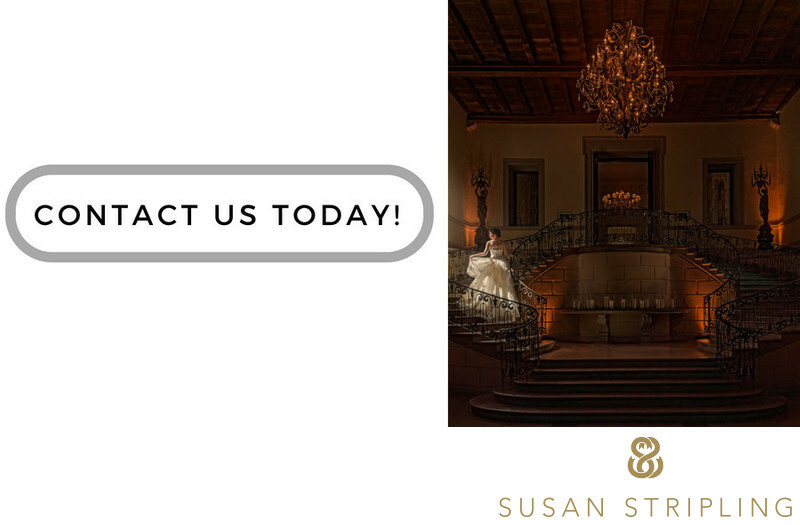 The indoor areas are so amazing that if it rains during your Oheka Castle wedding day, we have plenty of places to take pictures inside! I’ve talked about the rooms and lawns with brilliant light, but I haven’t talked about the small patches of light that are so incredible. I have come across beautifully lit areas on the stairs, in the hallways, under skylights, and near windows. While these light sources might not be big enough to take bridal party pictures, pictures of the couple together, or family pictures, they’re certainly big enough for compelling detail images. While shooting this wedding at Oheka Castle with the incomparable Rob Adams Films, I found myself in the bride’s getting-ready room for the detail portion of the day. We were waiting to be able to check into the bridal suite, and the room we were in was cozy and small. I was shooting the bride’s immaculate Vera Wang wedding gown when I saw a patch of light dancing across a small desk in the Oheka Castle hotel room. I placed the bride and groom’s wedding invitation directly in the light. From there, I got the engagement ring from the bride and placed it perfectly in the pool of light. It illuminated the ring, while still allowing for beautiful shadow and light in the background of the image. 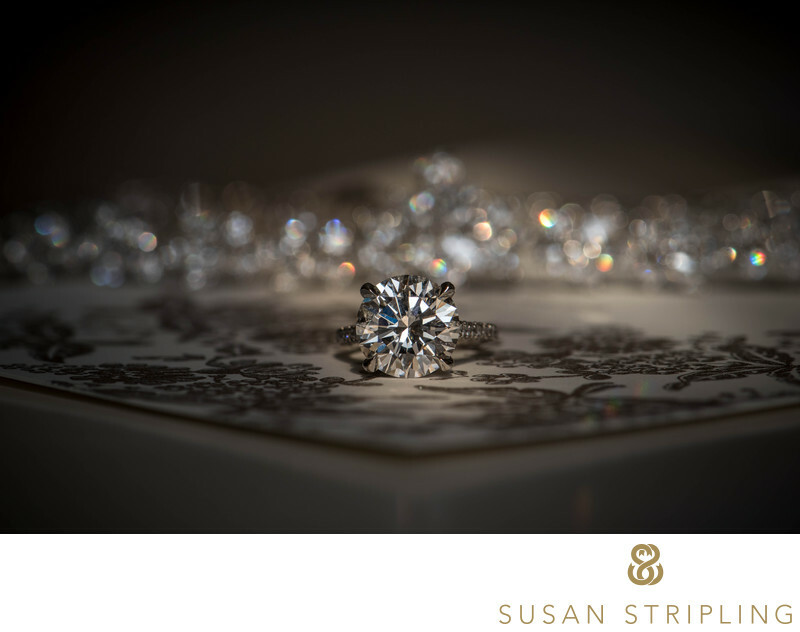 When shooting images of the details on the wedding day, I don’t just aim to take pretty wedding detail pictures. I am striving to create environmental portraits of these details. I want to show the time, place, and location that the couple is getting married in. I want the foreground and background of the wedding day detail image to be compelling and meaningful. Using the wedding invitation in this image really personalized this wedding ring shot for the bride and groom. This whole day was filled with brilliant light, and I was so pleased to start seeing that light so early in the day! 1/160; f/11.0; ISO 360; 105.0 mm.